German Merino sheep have a large frame, a straight head with a small woolly tuft on top, no horns, and rough, large ears that stick out to the side, with legs free of wool. 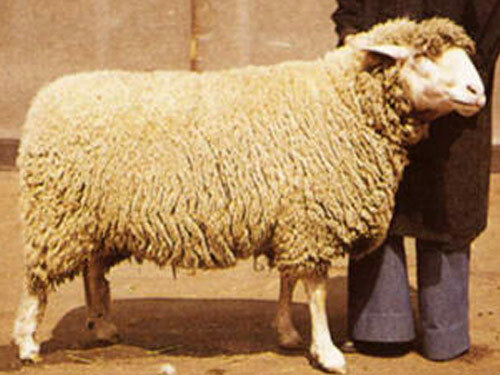 In the 18th century, Southern German Landsheep were crossed with French and Spanish Merinos, which produced the German Merino, or Merinolandschaf. They are the most common sheep breed in Germany today, at 40% of the total German sheep population. German Merino were developed from the dual- coated Zaupelschaf, which already in 1539 was not liked because it produced inferior wool. For that reason it was crossed with the Marschschaf from the Lower Rhine. This sheep was large, prolific, and could march, and its wool had a fiber diameter of 33 to 36 microns. Later, Merino wool sheep from Spain and France were used to improve the wool quality.